The next time you hit the slopes or just venture outdoors to shovel snow off your driveway, cause double-takes everywhere when you slip on this cool new Beardo Angry Cat Ski Mask. 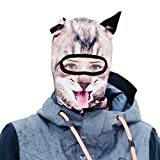 This hilarious ski mask AKA balaclava has an ultra-realistic HD printed cat face on it complete with pop-up pointy ears. Not only does it transform the wearer into a serious snow-loving feline, especially with ski goggles covering the eyes, it also helps repel the wintry elements by protecting against chilly temperatures, biting winds, and even the sun with UV protection. Also makes a great disguise for, ahem, cat burglars. Anti-Microbial treated - Clean and stink-free!